James McGrath has a nice review of Dale Allison’s Constructing Jesus, which I mentioned recently. Topics I especially look forward to, based on McGrath’s comments: (1) “gist” vs. “details” — the overall impression given by the sources vs. individual sayings/deeds determined to be authentic by the classic criteria; (2) consistency being the “hobgoblin of nonapocalyptic minds”; (3) willing and reluctant messiahs; (4) Paul having known a passion narrative. This will be Dale’s fourth and last book on the historical Jesus, and it looks like he’s going out with a bang. On Tuesday my father died at Community Hospice House. He’d been diagnosed with bone cancer in the spring and finally entered hospice when it was clear that he had about a week to live. It was my first experience with hospice, and I was struck by the intense level of individualized care provided by the staff. Quite different from hospitals and nursing homes. This mirrored the general care offered by hospices during the time of the earliest crusades (c. 1095-1187 CE). While the Hospitallers began assuming military duties by the 1130s, they still retained a focus on caring for the poor and diseased on a level that was, by contemporary standards, rather astounding. We’ve come a long enough way that separate beds and white bread may not seem terribly impressive, but our modern hospices continue to outshine other medical facilities in terms of holistic devotion to the patient. It’s an irony that these extraordinary institutions of care and compassion were first run by “holy warriors”, but as I’ve said before, the crusades are often unfairly maligned. I’m grateful my father was able to spend his final hours in such a place. Doug Chaplin asks, What Makes a Good Blog Comment Policy?, and it’s worth citing his complete answer. are very likely to have their comments deleted… especially if they are anonymous or pseudonymous and therefore holding themselves unaccountable. That’s not a bad policy, though I’m evidently more tolerant than Doug. Aside from irrelevant, commercial, or preachy spam (Doug’s third category), comments on my blog are seldom deleted. I hate to say it, but sometimes I even feed and encourage trolls who ride their hobby-horses (Steven Carr comes to mind). Maybe I’m too easily amused. Occasionally, however, I resort to the delete key when I see two elements persistently in play: pseudonymity/anonymity in conjunction with rude or hyper-aggressive argumentation. Contentious commenters who hide under rocks are lame. If you’re going to be especially critical of someone, you should at least put your name to it. Years ago there was an officious commenter, “Bilbo Bloggins”, who lurked over biblioblogdom like a yellow jacket. He wrote lengthy and snotty critiques, and I finally banned him, though like all pests he kept coming back under new pseudonyms. Aside from him, however, and occasional spammers, I really haven’t had much problem with commenters on this blog. But again, I think I’m more tolerant than most. Joseph Tyson tries to get a handle on the question of Luke’s ambivalence towards Judaism, and to account for the pro-Jewish side he finds the answer in a late dating of the gospel (c. 120 CE). “Luke rejected Marcion’s theology, and, to counteract his influence, he stressed the connection of Jesus and his apostles with Jews and Judaism.” Even aside from the unlikelihood of a late dating, an explanation like this doesn’t cut it for me. In listing the anti-Jewish texts of Luke-Acts, Tyson curiously has nothing to say about the strongest one of all: Lk 4:28-30, the only occasion in all of the synoptics (let alone Luke) where the Jews try to kill Jesus apart from general plotting which leads to his crucifixion. The only parallels to Lk 4:28-30 are found in John’s highly sectarian gospel (Jn 5:18, 8:59, 10:31), and with Philip Esler I think Luke was also sectarian. Once we appreciate Luke’s sectarian outlook, there’s little need to draw on heresies like Marcionism to account for his pro-Jewish retentions. If Esler is right that the Lukan community was made up of Jews and Gentile God-fearers who had been painfully excluded from the synagogue, then the fierce ties to Judaism make perfect sense. Luke becomes a parochial version of Matthew, reverent of the Torah for more isolationist reasons. Unlike Matthew who wanted to re-Judaize Christianity as much as possible, Luke wanted to legitimate its development out of Judaism as much as possible — and his general strategy was to show that Jesus respected the law for Jews as much as he transcended it for pagans. Judaism thus becomes a legitimate faith carrying within itself the seeds of its own transformation. Unlike the Matthean community which was deviantly and nastily competitive (but not apostate or sectarian), the Lukan Christians were no longer part of the synagogue, in no small part because they followed the same practice as the Pauline and Markan communities which put them beyond the pale: mixed table-fellowship. (The Mattheans, following the authority of Peter (Mt 16:18; Gal 2:11-14), refused to engage in such practice, as seen in the way Matthew revises his Markan source in Mt 15:21-28/Mk 7:24-30; so Esler, Community and Gospel in Luke-Acts, p 92; it’s one of Luke’s greatest coups that he was able to claim the support of Peter and James by reversing their historical roles.) The Mattheans adhered to the Torah in the context of messianic renewal, and they retained ties to the synagogue by the skin of their teeth. The Lukans, Jews and God-fearer’s alike, also respected the Torah (far more than Paul and Mark), but they allowed for its transcendence in ways that made them cast-outs. The way I see it, Luke was pro-Torah like Matthew, but also sectarian like Paul, Mark, and John, and it’s the relationship between these two that defines our answer to the question of Luke’s ambivalence towards Judaism. 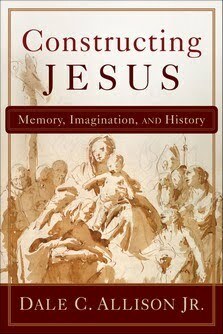 This I’ve been awaiting a long time: Dale Allison’s Constructing Jesus: Memory, Imagination, and History. Methodologically, the book will challenge the project of John Meier, who relies heavily on the classic criteria to get at the historical Jesus. There are loads of enthusiastic endorsements at Baker Academic, as well as the following table of contents. 6. Memory and Invention: How Much History? It’s coming out in November. In revisiting Douglas Campbell’s The Deliverance of God, I’m struck (even more than on first reading) by how unique Paul is made out to be when compared to his later interpreters. Readers unfamiliar with the book should consult my review for thorough summaries of the justification and transformation models in order to understand what follows. Early in the book Campbell chronicles the writings of theologians like Augustine, Luther, Calvin, and Melanchthon in order to assess the “ratios” of justification to transformation in each, and the mixtures naturally vary. For instance, Augustine reached a point where he abandoned all aspects of the justification model in favor of transformation. In the case of Luther’s later writings, however, aspects of both models became accentuated. The obvious question prompted by Campbell’s assessments (which I take to be fairly accurate) is simple: if Augustine’s thought evolved and changed, and if Luther’s theology became increasingly contradictory over time, why can’t Paul’s thought have evolved and changed, and why can’t his theology have taken on tensions and contradictions the more he thought about things? Campbell’s project puts me in mind of the Jesus-questors of the ’90s who thought it implausible that Jesus could have been apocalyptic and sappiential, or that he fasted and feasted, or that he attached positive valence to honoring one’s parents as much as hating them — all on account of inconsistency. You’d think that historical critics, by this point, would be comfortable respecting the biblical figures as human beings. For all their differences, Augustine and Luther shed light on the apostle’s own thought process. Paul went in the opposite direction of Augustine. Where Augustine first harped on justification issues and later abandoned them (almost completely) in favor of transformation doctrine, Paul began in reverse (“the solution preceding the problem”, as Sanders famously put it), with aspects of justification theory resulting as (almost inevitable) consequences of transformation beliefs. This, in turn, made Paul as contradictory as Luther (whose direction of thought was also opposite that of Paul’s), in the sense that justification is as much present in his thought as transformation is (especially in his later thought, witness Rom 1-4 and 5-8 respectively) — and we don’t need to whitewash the justification texts (esp. Rom 1-4) anymore than scholars of Luther try claiming that the Reformer didn’t mean what he said half the time. As I noted in my review, I don’t think justification and transformation are quite as contradictory as Campbell makes them out to be, especially by the standards of Paul’s day where human will and divine election went hand-in-hand. Many of the tensions are judged as such (and quite understandably) by the horizons of modernity. Yet it’s fair to grant Campbell at least some incoherencies between the two models. What we can’t grant is that Paul was incapable of being incoherent himself.